Institutions need to be nimble in response to the rapidly changing needs of students in the 21st century. Open interoperability standards in educational technology mean that colleges and universities can make their buying decisions based on what is best for their students, rather than be constrained, or "locked in," by what is compatible with existing investments. With a view to serving the best interests of students and the institutions that support them, Blackboard has committed itself as an exemplary partner and Contributing Member of the IMS Global Learning Consortium. —Jace Howard, Senior Director, Cross Platform, Blackboard, Inc. The IMS leadership community collaborates on open standards that remove major barriers to implementing the key technologies that support institutional initiatives, mitigate vendor lock-in, and promote innovation in the edtech market. “We don’t want our partners to have to develop the same technology several times or limit their investments to one particular platform. 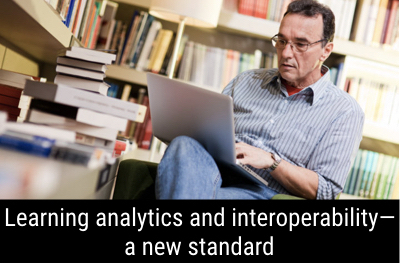 Thanks to open standards they can develop once, focusing their efforts on innovation rather than compatibility,” said Timothy Harfield, senior product marketing manager for analytics at Blackboard. One of the areas that IMS is currently focused on is Real-time, Cross Application Educational Data and Analytics—providing a foundation to make it easier to get usage and progress data out of any application or platform. And one of the outcomes of this initiative is Caliper Analytics®, the first interoperability standard for click-stream analytics created by the education community for the education community. Helping to lead in the evolution of the Caliper standard was a no-brainer for Blackboard because as a company, data analytics is something they take very seriously. During Blackboard’s annual conference—BbWorld 2017—the company highlighted the notion of “data everywhere” and emphasized analytics as a core pillar of their strategy and mission. “We believe that access to data and actionable insights will be key to the way that the LMS evolves over time and this is something Blackboard is definitely committed to leading through both technology development and through research,” noted Tim Tomlinson, chief product officer. Howard also noted that another positive takeaway from the IMS collaboration is that when other vendors and leaders in edtech see that we’re working together to create the standards and provide meaningful research, information, and validation of standards to the community, they are more confident in what the community is producing. —Phill Miller, Vice President of Teaching and Learning, Blackboard, Inc. Blackboard is committed to the work that the IMS Global is doing to advance open educational technology standards. Phill Miller sits on the IMS Board of Directors; Product Director Wade Weichel serves on the LTI Steering Committee; John Whitmer is the co-chair for the IMS Privacy Task Force, and Rachel Scherer, Sr. Product Manager, Analytics, will be participating on the IMS Analytics Product Steering Committee. This leadership is evidenced by their support and certification for a wide range of standards across multiple products. Looking ahead, Blackboard will continue its strong advocacy of open standards through its IMS Global membership, sponsorship of the Learning Analytics initiatives, and active participation in a variety of steering committees. As a recognized leader in learning analytics, Blackboard is using its deep expertise to shape the Caliper Analytics standard, while also promoting its widespread adoption and working as a champion of privacy and transparency in the use of educational data. 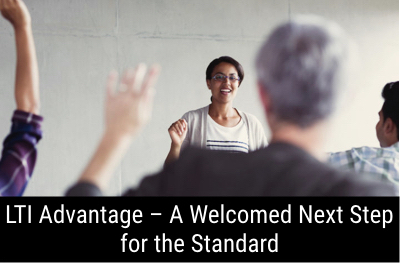 More specifically, in the near term, they plan to be among the first to support LTI Advantage, the next phase of implementing and certifying the Learning Tools Interoperability® (LTI®) standard that will help institutions move beyond first generation learning architecture. Blackboard is the leading provider of learner success-focused technology solutions and services, serving over 16,000 clients across 90 countries reaching 100 million users. Its product portfolio is unmatched in the marketplace, spanning teaching and learning, analytics, community engagement, campus transactions and security solutions as well as student services. With an unmatched understanding of the world of the learner, the most comprehensive student-success solutions, and the greatest capacity for innovation, Blackboard is education's partner in change.